Grandma Old Fashioned Apron, an apron that covers front & sides. Kitchen aprons with rick rack and large apron pockets. Christmas aprons. 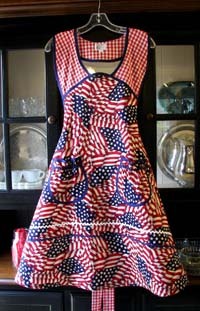 Retro style aprons made in America for sale. 1940 Aprons in red blue pink & yellow gingham. Retro Pink, Red, Black and Blue Polka Dot Aprons. Women's Apron #121 $49.95 ex-large $54.95 and get in matching girl aprons #204 $39.95, child large $44.95. Step back in time with our Vintage Apron line. This beautiful apron is not only attractive but also has pretty trim that makes you step back to the 1940's, one your grandma could have worn. Long apron ties make this comfortable. You will love the way this beautiful vintage style apron looks on you. 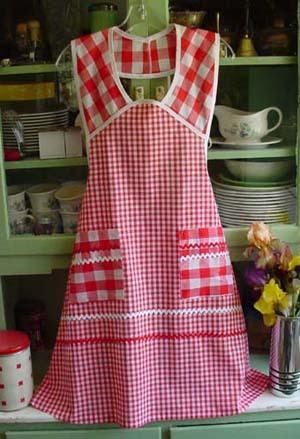 The top and apron pockets are a large red gingham, with the rest of the apron in a smaller red and white gingham. Aunt Rosie Old Fashioned Fruit on Yellow Women Aprons #2176. Aunt Rosie old fashioned fruit with a soft yellow background with green ric rac and strawberries, peaches and cherries. This will remind you of all the meals around Grandma's kitchen table. 1940 Cherry Aprons #2178 $49.95, extra large $54.95. 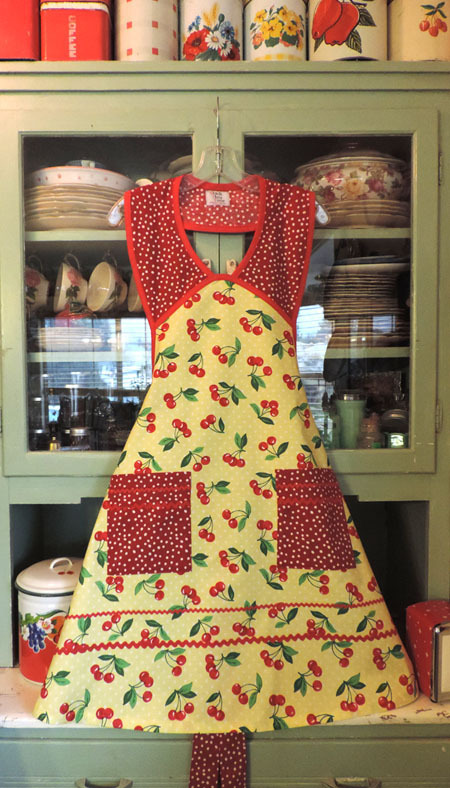 You can also get this cherry apron in girl sizes #33029. Retro 1940 Women Cherry Apron with yellow polka dot background and red polka dot pockets and ties. New - Just in in time for cherry season! Red Cherries on yellow polka dot, oh so cute! Looks like you just picked it off your cherry tree..
Heart Gingham apron, comes in women aprons #116 and girl sizes #70002. This beautiful heart apron comes in all our ginghams and many of our other pretty fabrics. Our heart apron was worn by "The Nanny" on the television show "The View" with Rosie O'Donnell February 13th 2008. 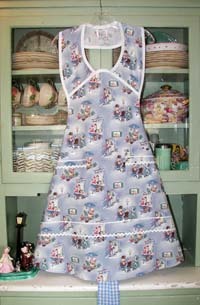 Our customers call our aprons the I Love Lucy apron or June Cleaver apron. We also hear a lot from customers our aprons look like Aunt Bee's apron. 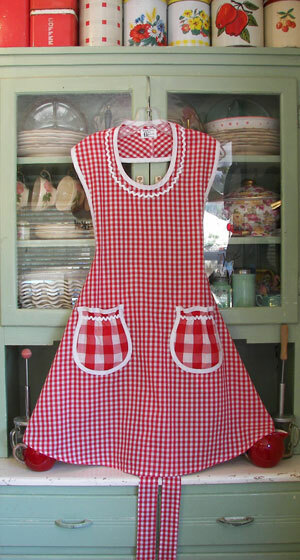 Retro Red Gingham women half aprons, #303 $47.95 ex large $52.95 and also comes in girl matching red gingham apron. 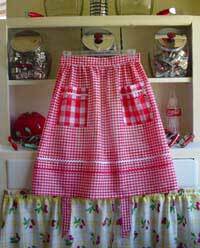 Retro red gingham half apron with large red gingham pockets. Red and white rick rack will make this one of your favorite aprons in the kitchen. Pockets come in a larger red and white gingham for that retro look. 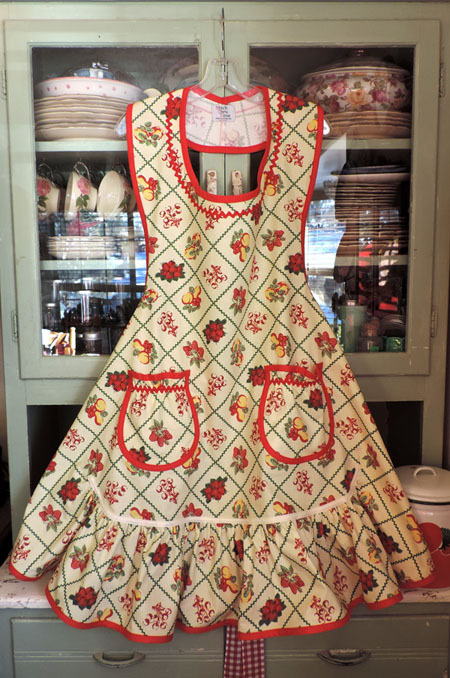 An old fashioned half apron in woman and girl sizes. Who doesn't remember wearing an apron with your mother in the kitchen. Make your own memories. 1944 Red gingham women apron #325 $57.95. 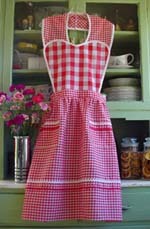 Beautiful half apron in red gingham. 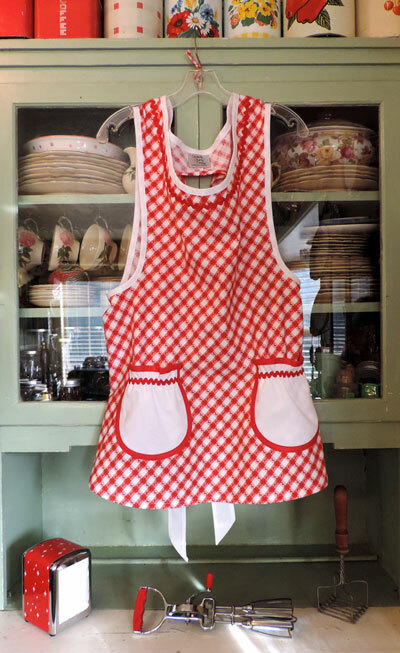 A full half apron in red gingham with white trim and rick rack set off this retro half apron. 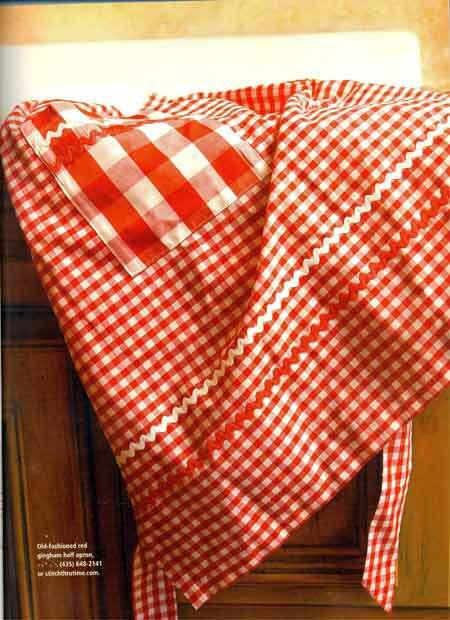 Specially designed apron pockets have white ric rac and trim to add to the retro large red gingham pockets. All white retro 1948 ruffle half aprons worn at the Kate Spade grand opening in Hong Kong. 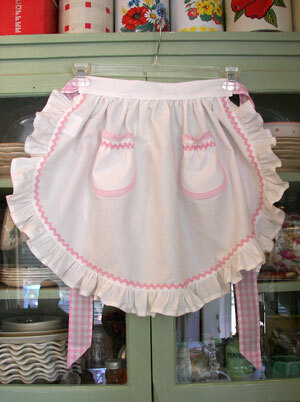 1948 Ruffle Half Apron is shown in a child size. Women Ruffle half apron #40012 $52.95 ex-large $56.95 and girl ruffle half apron #4035 $46.95. 1948 apron available with round or square pockets. Above apron shown in child size and you can get this pretty half apron all our other fabrics. Pink gingham heart apron for women #160 $59.95, extra large $64.95 and girl #70005 $53.95. 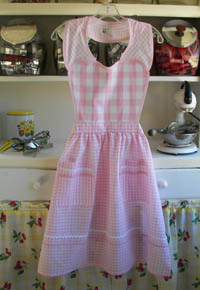 Pink gingham heart apron now comes in pretty pink gingham. Our retro heart apron for your special someone. The heart apron also comes in red, blue and yellow gingham, and our other fabrics. 1940 Patriotic Apron #170 Woman Apron $49.95 ex-large $54.95 and child Apron #231 $39.95 girl large $$45.95. 1940 apron in red white and blue flags. Comes with square pockets unless you request round pockets. Red gingham on the top of this pretty 1940 apron with Rick rack on pockets and bottom. Grandma apron in yellow gingham. Women aprons #158 $49.95, extra large $54.95. 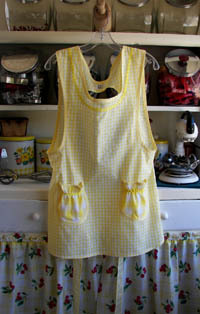 Grandma apron in yellow gingham with roundor square pockets, a larger gingham on the pockets. An apron that fits comfortably on your shoulders, a cute Granny apron. Grandma Old Fashioned Red & White Kitchen Apron #2166. Comes with round or square pockets and you can get the pockets in the same material. You'll think your still sitting at your Grandma's kitchen table when you wear this old fashioned apron. Also comes in a blue and white kitchen apron. 1940 apron in Christmas Carolers. Woman Apron #2027 $49.95, $54.95 for extra large and girl apron $39.95, size large child $44.95. 1940 Apron in nostalgic Christmas Carolers. A Soft blue background with singing children and dog. Old Fashioned lamp post and Victorian children. All we can say is cute. This darling Christmas apron is reminiscent of Christmas past. Christmas Carolers, Christmas trees, Victorian style children looking in the windows at toys. A fun Christmas apron you'll love. Christmas carolers fabric is available in all our apron styles. "Aunt Rose Apron" in Red Gingham Woman Apron #109 $49.95 ex large $54.95, gGirl #233 $39.95 child large $44.95. 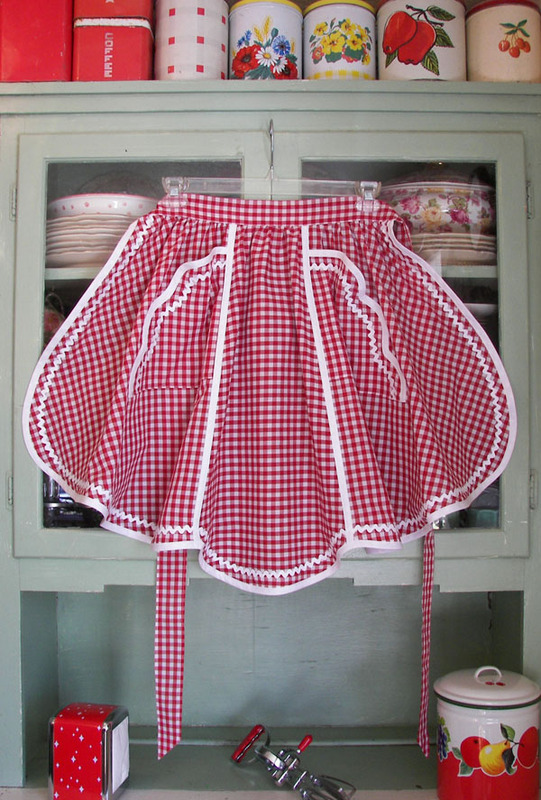 Rose style apron in red gingham with white trim and rick rack for the old fashioned look. This comfortable apron with pretty round gathered pockets covers you so your clothes stay clean. 100% washable for an apron that will last. 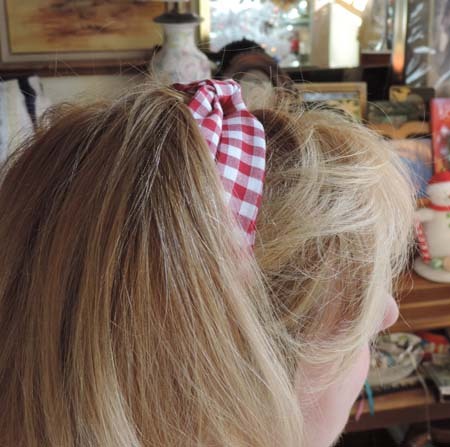 Vintage Hair Wrap Red Gingham - Red Polka Dot #2222 $15.95. 100% machine washable. Women hair tie in red gingham with red polka dot. Ties around your head so it fits comfortably. This pretty hair wrap also comes in many of our other fabrics. Wild Blue Hair Tie with Flower #2225 $15.95. Retro Hair with a pretty flower. You'll think your back in the 60's and will loved the way it fits. You tie this hair tie in a knot so you can adjust for your custom fit. 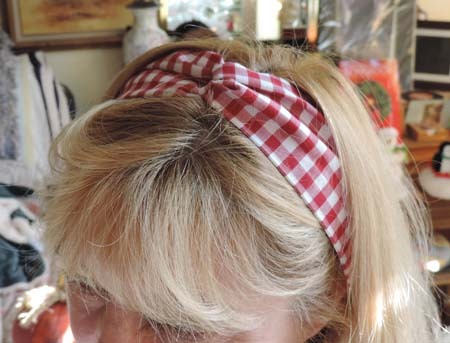 1950 Lucy Hair Wrap in Red Gingham $14.95. Old fashioned hair tie with elastic on bottom for a comfortable hair tie. You may get a matching hair tie for your apron. Get this pretty hair tie that loops around the front. An old fashioned 1940 1950 hair tie. Matching apron and hair ties. Hair tie to match your apron. 1950 Retro hair wrap with elastic at the bottom and is fully covered in material. Retro Red Gingham half apron featured in Romantic Homes magazine.